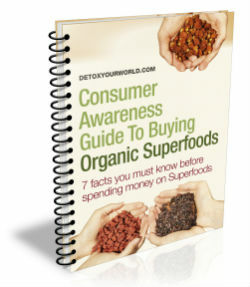 Organic almonds are a particularly wholesome superfood that grow on the almond tree (Prunus dulcis), which has been cultivated in southern Europe, the Middle East, North Africa and Asia since as long ago as 2000-3000 BC. Almonds are actually the stone of the almond fruit (rather than a nut) and boast a hard shell that is similar to the cherry, plum and olive stone. Organic almonds are loaded with beneficial nutrients including vitamins, minerals, fibre, vegetable protein, folic acid and monounsaturated fatty acids and are routinely added to skin care products, as the polyphenols (flavonoids) that they contain help to promote beautiful, even skin. Traditionally used to prepare almond paste, marzipan, nougat, almond oil and almond milk, organic almonds make a delicious rawfood snack straight from the bag and are ideal for combining with other nuts and / or dried fruit in a home made trail mix or dessert topping. 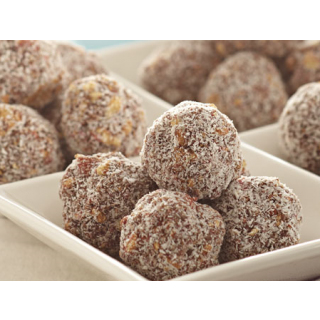 In addition, organic almonds are the perfect ingredient in a range of raw salads, cakes, biscuits, chocolates and other sweets including our tempting almond and coconut bonbons showcased below. Chop up your ½ cup of almonds. Firstly pop the organic dates and almonds into your blender and blitz until they form a rough, sticky paste. Next add the 1/2 cup of raw cacao powder and blend until thoroughly mixed in. Now remove the mix from the blender and place into a large mixing bowl. Stir in the desiccated coconut, coconut nectar chopped almonds, and organic vanilla bean powder and mix until nice and smooth. Next shape the mixture by hand into round balls (using approximately 1 heaped tablespoon per bonbon). 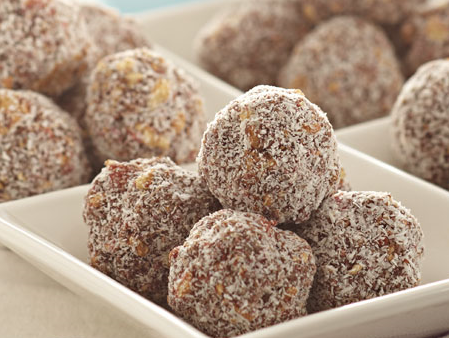 Finally roll your bonbons into the remaining 2 tablespoons of desiccated coconut and place into the refrigerator to chill for around one hour before serving.